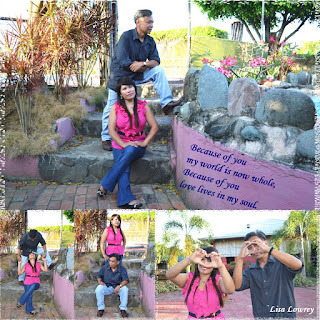 A week ago, I did the pre-nuptial photoshoot of Jhun and Rose and I posted it here in my blog. Yesterday morning was their wedding at Prima's Resort. The unique thing about the wedding is that all of the bride's maids and the maid of honor are all married and I'm one of them, lol! Also, two of the groom's men are married too and that includes my hubby. The wedding ceremony started at 9:00 AM at the resort's garden. It was solemnized by a pastor. While the bride was marching with her mom and brother down the isle, the groom was serenading her with a song. The groom has a very nice singing voice and so does the bride. During the ceremony, the pastor asked the groom first to share his testimony on how he got saved followed by the bride. To me that was so cool! I like hearing how people came to know Jesus Christ and accepted Him as Lord and Savior of their lives, After they were pronounced husband and wife by the pastor and had their first legal kiss as a couple, they had a duet. They rendered the song "Household of Faith" and their voices blended so well and was well applauded. The bride did the second voice. Some people said that it was their first time to hear a couple singing a duet during their wedding. Most of the time, somebody will render a special song to entertain the couple and the visitors. Here are some photos taken by my li'l brother. I love photography and taking photos but I just do it as a hobby. I've never done any photo session for others before. I was so ecstatic when I got the privilege to do the pre-nuptial pics of Jhun and Rose last Sunday afternoon. Well, it was my first time to do this kind of photo shoot but I really enjoyed it. The couple will have their wedding this coming Saturday at Prima's Resort and reception to follow after the ceremony. Their schedule was so hectic so instead of going to Baguio City for the photo shoot as planned, we just did it at the wedding venue. We went there around 4PM and it took us maybe more than an hour. It's good the couple were so cooperative and did the poses that I suggested to them. The photos came out good and the couple love it. I'm in the process of editing it and make a slide show to be shown during the reception. By the way I used my Nikon D3100 which I bought in the states a couple of months ago. Here is a preview of the photos I took. This post is a continuation of our vacation in Iowa last July. Six of us went to the lake one fine day that summer and that includes me, hubby, Wayne, Melissa, Sherry and JJ. Lake MacBride is located in the South-East part of Iowa. It is approximately 12 miles south of Cedar Rapids, IA. As usual, we brought with us some foods to eat so we don't have to starve or buy instant food sold at their counter. Lots of people were boating that day, some were swimming, others were sunbathing. We ate lunch first and then Sherry, JJ and Wayne went canoeing. I never rode a canoe before and I was hesitant to try so I just watched them while riding their canoes. I was later persuaded by Sherry to try the paddle boat when I went down the ramp to the boat rental place, where they rent out canoes, fishing pontoons, rowboats, weird water-bicycle-floaty-things and of course paddle-boats. It was warm that day but I enjoyed the scenic view we passed by while on the paddle boat. My skin became darker after that. I was the only Filipino among the group and I look so dark sitting beside these fair-skinned Caucasians. It made me wish to have a fair skin too, lol!